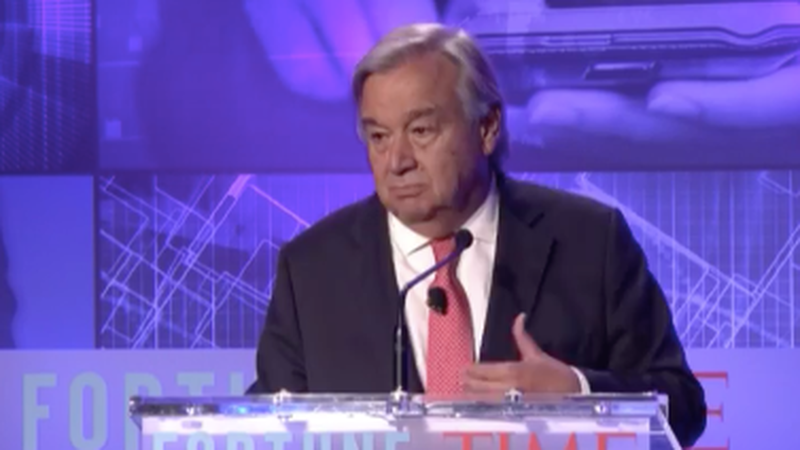 UN Secretary General Antonio Guterres discussed the emergence of populism across the globe at the Fortune and Time CEO Initiative Conference Monday. Photo: Fortune. UN Secretary General Antonio Guterres sat down with former managing editor of TIME, Nancy Gibbs, at the Fortune and Time CEO Initiative Conference Monday and addressed the growing insecurity that is bubbling up in society, and how it has birthed the rising populist movement across the globe. "It's easy to condemn populism, but i think its better to address why it's emerged. I think people are insecure... In this environment there are winners and losers. The losers feel that the government is not taking care of them... there's a level of mistrust... but these problems will not be solved in the past. In the past people expected governments and the markets to provide. Now we need to think how can we together, I wont say regulate, but how can we work together to make sure that these kind of inevitable revolutions can be done without social unrest."